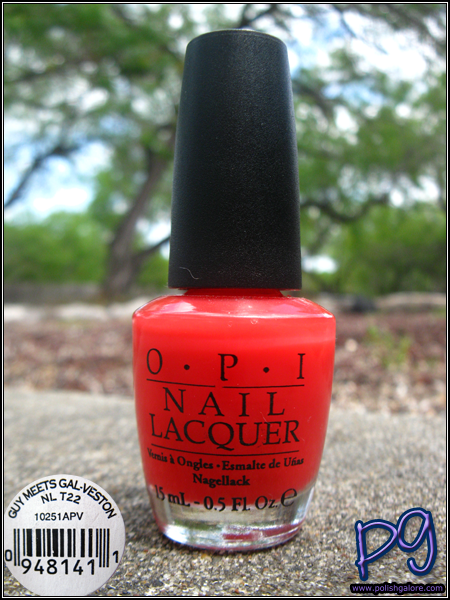 Continuing with the sorbet section of the Texas collection is Guy meets Gal-veston, an 'engaging" coastal coral. Okay, I've said it before but I'm going to seriously say it again. OPI, who does your promo pictures? See my bottle picture? Here is the one that OPI produced in their press release. Anyway. I used a base of OPI Natural Nail, 3 coats of polish and a top of OPI Top Coat. As with sorbets/jellies, this is not opaque. Even though it does have a watery squishy finish, it's not bad - I could see myself being able to deal with this color pretty decently. Here in the shade you can see that it can definitely hold it's own. It's more red than coral to me, but it's still pretty for the summer. Finally indoors with the flash and you can see a bit of VNL on my middle finger. I think this is probably my favorite so far for the sorbets. I'm just not much on the sorbets. I like opaque. I totally agree about OPI's promo pictures not matching the actual polish at all!! I recently this polish looks more orange/coral alone (like in your bottle picture), but more red when next to other more orange polishes. It looks pretty red in your swatches, though! I like this color, but I'm still not sold on the whole "sorbet" thing. I wish they were more opaque!